A preliminary sketch of the playground at Lincoln Park illustrates the playground’s inclusive concept. LIMA — After three years of “doing their homework”, the City of Lima Parks & Rec Department is ready to ask Lima City Council for the funds to construct a unique playground at Lincoln Park. Known as an “inclusive playground”, the project’s goal is to unite children in play no matter if they are dealing with a physical or mental disability. To create the playground, an area of Lincoln Park will be fenced in and installed with turf and a parking lot will be constructed nearby. Together with the purchase of some of the playground pieces, Parks & Rec Director Ric Stolly estimates the project will cost $270,000, with 70 percent of the funds coming from state and corporate grants. The mayor’s administration is planning to request Lima City Council to move funds from the city’s general fund to cover the remaining cost of the project, or roughly $80,000. If funds are approved, Stolly expects the project to be finished by Memorial Day. Stolly said the new playground at Lincoln Park would make the area a destination for families with children with disabilities. Compared to the standard playground, an inclusive park makes it easier for individuals with a wide range of both physical and mental challenges to play. For example, some playground pieces are at ground level making them more accessible for children in wheelchairs. Other pieces consider the challenges of autistic children who may need a comfortable safe space. 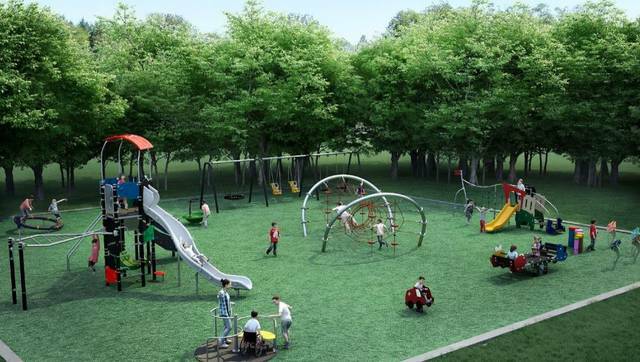 The city’s Lincoln Park project is just one of three inclusive playgrounds currently being planned for the region. The Allen County Board of Developmental Disabilities is currently putting together preliminary plans to update Marimor School’s playground in order to transform the space into an extensive inclusive park that could be access through the Ottawa Metro Park. That project is currently slated to be completed sometime in 2020. Board of Developmental Disabilities Executive Director Theresa Schnipke said a third project is also being planned by The Arc of Allen County at Camp Robin Rogers. If all three projects are completed, inclusive parks would be available in Lima as well as the east and west sides of Allen County. “It’s a win-win for people with disabilities because they can access it from across the county,” Schnipke said. https://www.limaohio.com/wp-content/uploads/sites/54/2018/10/web1_parkPicSnip.jpgA preliminary sketch of the playground at Lincoln Park illustrates the playground’s inclusive concept.